Below you will find some screenshots of AniTuner taken under Windows XP . Note that AniTuner does not rely on Windows themes: it will have the same look exactly even under other Windows versions such as Vista, 2000, ME or 98. This is the main window of AniTuner: you can navigate through the different pages using the "Tools" panel on the left side. Thi is the "Cursor Properties" page. The "Cursor Preview" panel displays the live animated cursor that is currently edited. Edit the frames of the animated cursor: add, edit, remove, import & export images, set duration, move frames, reverse order or apply transformations like horizontal/vertical flip, rotations, image merging... You can also drag and drop frames to change their position in the list. 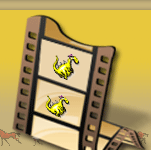 Build animated cursors from animated GIF, AVI files, bitmap strips or a set of image files. AniTuner can automatically detect the transparency if available or let you define which parts of the loaded image or animation should be transparent. Do not worry about color depths: AniTuner takes care of everything. With AniTuner, you can easily make small animated smiley and emoticons from a set of images or animated cursors in a snap.